Possibly Sinclair's most famous product (albeit for quite the wrong reasons), the ill-conceived C5 "electric car" proved to be the point at which Sinclair Research's wheels finally fell off. Attracting controversy and derision in equal measure, the C5 fiasco ended up having a catastrophic effect on Sinclair's finances. Losses of up to £7 million eventually forced the company to sell its computer business to Amstrad. The C5 was promoted by Sinclair as a revolutionary advance in personal transport with the potential to replace the car. The original intention was that it would be only the first in a whole series of electric vehicles - it would have been followed the never-released C10 and C15, each successively bigger and looking more like conventional vehicles. At only £399, the C5 was a fraction of the price of a conventional car. In fact, it was not a car at all but was instead a glorified electric tricycle, powered by an electric battery with a supplementary pedal drive. It did not inspire confidence that the C5 was assembled and serviced by Hoover, better known for its washing machines, which led to unkind comparisons being made between the two product lines. I would not want to drive a C5 in any traffic at all. My head was on a level with the top of a juggernaut's tyres, the exhaust fumes blasted into my face. Even with the minuscule front and rear lights on, I could not feel confident that a lorry driver so high above the ground would see me. Small wonder that one of the accessories listed in the C5 brochure is a high and bright-red reflecting mast, said by the Royal Society for the Prevention of Accidents [RoSPA] to be a 'must'. The "hi-vis mast" initially had to be purchased separately, but public pressure by the RoSPA and media eventually forced Sinclair to include it in the C5 package. By then, though, the damage had been done and even then it failed to satisfy everyone. The safety aspect so worried the authorities in the Netherlands, the most cyclist-friendly country in Europe, that the C5 was banned outright. Fewer than 17,000 C5s were sold, mostly in Britain although a few made it to continental Europe and the United States, and production was halted after only a few months. Some were reputedly bought by shipping companies to ferry deckhands around the huge foredecks of oil tankers. C5s are now highly sought-after collector's items and now sell for up to £900, although £300-£400 is a more likely value. One British stuntman has even turbocharged a C5 to 70mph (!) and races it through tunnels of fire. 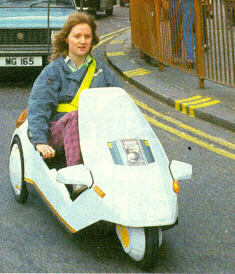 Sir Clive Sinclair would no doubt have known what that felt like in the wake of the C5's hostile reception. 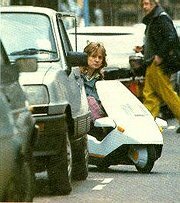 for other websites on the Sinclair C5.